I decided to read and review Ryan David Jahn's book The Dispatcher because - well let's face it- the setting is in East Texas and that was fascinating to me. You may recall that this Colorado/Alaskan/among a lot of other states girl married a Texas boy. I had never even been to Texas when we met but a couple of years ago I got the chance to tour Texas with him and while it might not be my first choice, (Colorado mountains and then Hawaii) Texas totally grew on me. We've been back since to visit my mother-in-law in East Texas and it's quite the possibility that someday in the future I'll live there. So. Then I'll admit that I might be a oddity in girl-world for liking some non-girlish things. For instance -- when I read on the back that it's probably a cross between No Country for Old Men and Quentin Tarantino -- I'll admit I was intrigued. Ian Hunt is a police dispatcher in East Texas. Just as his shift is ending he gets the call from his fourteen-year-old daughter -- who was declared dead four months earlier. The call is cut off by the man who snatched her from her bedroom when she was seven. A basic description of the kidnapper is all Ian has to go on. The trail leads to a local couple, but this is just the start of Ian's fight to get his daughter back. What follows is a bullet-strewn cross-country chase from Texas to California along Interstate 10 -- a wild ride in a 1965 Mustang that passes through the outlaw territory of No Country for Old Men and is shot through with moments of macabre violence that call to mind the novels of Thomas Harris. Wow. Just typing that I realized I didn't get to the part of "Thomas Harris" and have never heard of him. Googling now. O wow! Silence of the Lambs guy! Crazy. Ok.
Good book. Good story. Good writing. Not so good for a stay-at-home-mom to be reading about child abduction while alone in the house during the day. Hello! But still -- I totally sucked it up. I still think it's a "guy" book. I was just telling my husband about it now and now he's going to read it. You must be aware that there is a lot of disturbing things in this book -- a child abduction and the body count does start piling up. There are also time where I just wanted to slap Ian Hunt and the tiny Texas police force. I definitely wouldn't have handled the whole situation like they did. Psychologically, there are quite a few interesting characters. What would you do if you were Ian Hunt and knew who took your daughter and that he still has her? How would you mentally survive being a kidnapped 7 year old and held in a basement for 7 years? The book's perspectives were fascinating because I was expecting a single point of view. Instead, we are in the heads of Ian Hunt, Maggie (the kidnapped girl), the abductor, and Diego Peña (another cop). By jumping around to the characters you really see all their perspectives and it's quite fascinating. 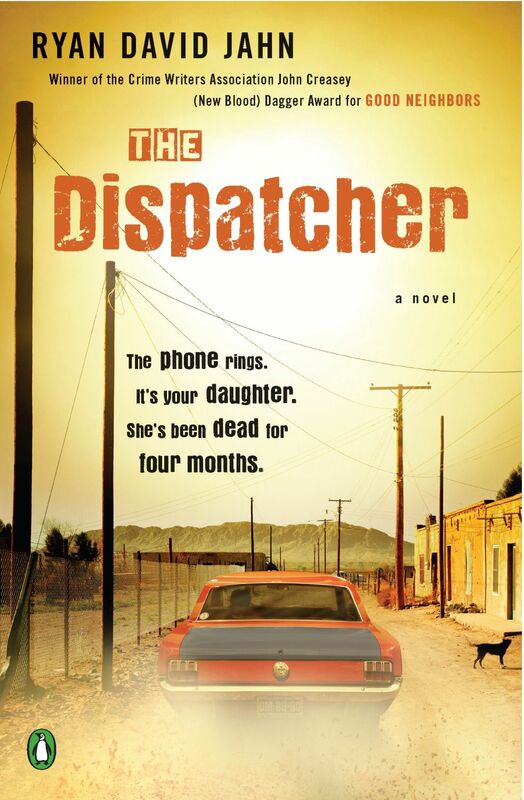 I was at a library book sale last week and found a copy of The Dispatcher just like the one I have. Interested? Fill out the form below. The contest will run through March 26th and is open Internationally. Good luck! !